Screw piles are foundation underpinning elements constructed using steel shafts with helical flights. These are also referred to as screw anchors, helical piles, and helical anchors in the market that use them for building deep foundations. Screw piles are cost effective foundation systems installed using excavators fitted with a rotary driver head attachment. Presently, it is observed that many builders opt for screw piles when time constraints are involved with their construction projects. End-users are opting for high quality recycled steel screw-piles. This is found to be effective and has prevented the overall carbon footprint. The global screw piles market is estimated to reach US$ 1,365.4 Mn by 2027. The global screw piles market is primarily driven by rapid growth in the construction sector across the globe. In addition, rise in huge investment by governments on infrastructure and public facilities has gained demand for screw piles. Furthermore, continuous growth in the commercial sector such as commercial kitchens, healthcare, business parks, institutions, and entertainment has led to the usage of screw piles in construction of foundations. Screw piles are mostly preferred in urban construction due to its better ability of displacement, load bearing capacity, minimal site disturbance, immediate load carrying capability, and quick installation. Rise in marine, industrial, agricultural, defense, and the overall government sector has enhanced innovative civil structures. This is also boosting the screw piles market. One of the major challenging factors impacting the growth of the screw piles market is increase in cost of raw materials such as steel, iron, etc. for manufacturing of screw piles. Additionally, inadequate soil conditions, and limitations imposed on installation of screw piles in construction due to geo-technical factors is a significant factor hampering the market. Additionally, limited number of suppliers providing customized screw piles as per requirement of the foundation, and fluctuation in demand patterns are projected to generate medium demand for screw piles. However, increase in construction in the residential and non-residential sector is providing lucrative opportunities to the screw piles market. End-users are also opting for customized foundations that vary with the structure of piles. This is also an opportunity for manufacturers across the globe. Governments of various countries are emphasizing on building the infrastructure, public utilities, and transportation facilities. This also offers opportunities to enhance the sales of screw piles. Increase in dependency of screw piles for construction has been a major trend. Dependence on screw piles for foundation and anchoring has been rising in the commercial construction sector. Robust continuous growth in the field of residential, non-residential, and industrial sectors are anticipated to play an important role in the growth of the screw piles market. In addition, rise in innovative construction such as solar farms, agricultural construction, and modular construction has also led to popularity of screw piles due to its quick installation ability and building up structure. This report on the global screw piles market provides analysis for the period 2017–2027, wherein 2018 is the base year and the period from 2019 to 2027 is the forecast period. Data for 2017 has been included as historical information. 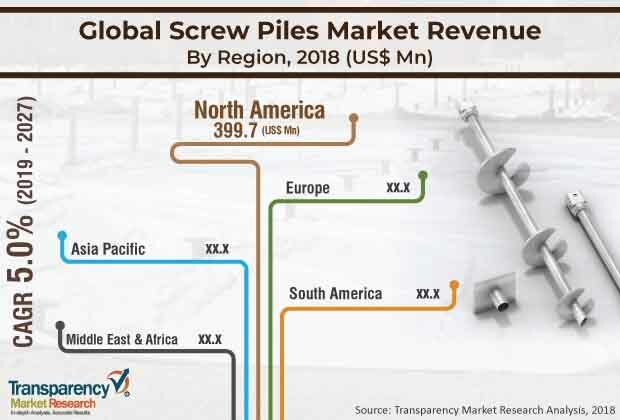 The report covers market dynamics including drivers, restraints, opportunities, trends, and policy and regulations which are expected to influence the growth of the screw piles market during the said period. The study provides a comprehensive analysis on market growth throughout the above forecast period in terms of value and volume estimates (US$ Mn and Thousand Units) across different geographies. The screw piles market report cover all the products that are categorized based on type, application, and distribution channel. The continuous growth in construction sector is seen as a key driver of the screw piles market across the globe. Increasing demand from the commercial construction industry is expected to offer significant growth opportunities to the screw piles market in the coming years. Contractors and developers entering into interdependent collaborations to further develop critical technology are also driving the screw piles market. The screw piles market has been segmented based on screw piles type, application, distribution channel, and geography. The market has been segmented on the basis of application into SS-RS combinations type screw piles, SS (Square Shaft) type screw piles, RS (Round Shaft) type screw piles, and Helical Grouted Displacement Piles (HGD Piles). Based on application, screw piles are segmented into utility, Railways, Roadway, Bridges, & Walkway (RRBW), Agriculture, construction, marine, commercial construction, and others. Further, the market based on distribution channel is segmented into online channel, and offline channel. Geographically, the report classifies the industry into North America, Europe, Asia Pacific (APAC), Middle East & Africa (MEA), and South America; the regions are analyzed in terms of value in the screw piles market. Furthermore, region wise prominent countries covered in the report include the U.S, Canada, Germany, U.K., France, China, India, Japan, GCC, South Africa, and Brazil. The report also includes key developments in the screw piles market. Porter’s Five Force Analysis which identifies bargaining power of suppliers, bargaining power of buyers, threat from new entrants, threat from substitutes, and degree of competition is also included in the report. Value chain analysis that shows work flow in the screw piles market and identifies raw material supplier providers and distribution channels of this industry is covered in the report. Segment trends and regional trends have been added in the report. It also covers segment wise incremental opportunity analysis and country wise econometric analysis which shows a country’s economic information, which includes population, GDP, consumer spending per capita, disposable income per capita, and purchasing power parity. Furthermore, the report covers competition matrix of key players in the scope of study. Incremental opportunity analysis identifies and compares a segment’s attractiveness on the basis of CAGR and market share index across North America, Europe, Asia Pacific, Middle East & Africa, and South America. The same has also been provided for each segment in terms of screw piles type, application, and distribution channel. The report also includes competition landscape which includes competition matrix, market share analysis of major players in the global screw piles based on their 2017 revenues, and profiles of major players. Competition matrix benchmarks leading players on the basis of their capabilities and potential to grow. Factors including market position, offerings, and R&D focus are attributed to a company’s capabilities. Factors including top line growth, market share, segment growth, infrastructure facilities, and future outlook are attributed to a company’s potential to grow. This section also identifies and includes various recent developments of leading players in the screw piles market.